There are so many iconic characters in the Disney dynasty. While they are all wonderful and lovable, I have a special place in my heart for that little orange and white clownfish with the “bad fin” – which is why I was just as excited as my boys when we received the Blu Ray Ultimate Collector’s Edition 5 DVD Combo Pack of Finding Nemo for review. Available starting December 4th, the Finding Nemo Ultimate Collector’s Edition 5 DVD Combo Pack features five discs of fishy fun with a cast of characters that include Albert Brooks,Ellen DeGeneres and Willem Dafoe . Included in the pack are a standard DVD, a Blu Ray DVD, a Blu Ray 3D DVD, a bonus disc, and a digital copy. I love these types of combo packs because it really does give you a lot of viewing options – at home or on the road. The Ultimate Collector’s Edition MSRP is $49.99. There will also be a 2 disc Blu Ray edition available for a MSRP of $20. Finding Nemo is rated G and has a running time of approximately 100 minutes. My boys and I loved watching Finding Nemo together. The Blu Ray quality is fantastic – the characters really come to life on the screen. While some of the shark scenes are a little scary, my 4-year-old was able to handle it well – especially since there’s a happy ending to the movie. The bonus disc includes 2D and 3D virtual aquariums which was a fun experience for all of us. We already put the standard DVD in our travel case for when we hit the road this holiday season! 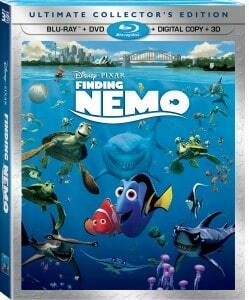 If you have a Finding Nemo fan in your house, the Ultimate Collector’s Edition is a great holiday gift. You can find out more about it on the official Finding Nemo webpage, where you can also download activity pages, play games and enter a sweepstakes for a five night stay at a Disney animation resort! You can also find Finding Nemo on Facebook. Great, GREAT movie… Not only do my niece and nephews love this movie, I always end up crying or laughing myself (especially when Ellie does the whale language). This movie is a favorite around here, but I think having it in blu ray will make it extra special this year 🙂 It’s definitely worth getting it again! Thanks for the review – I think this is the only Pixar movie I’ve actually never seen! I’m not sure why, and I was wondering if I should buy it for my 8 month old son and which version to get. Your article was very helpful! One of Pixar’s Best in my opinion! 5 discs is incredible – I bet there are some awesome bonus features!